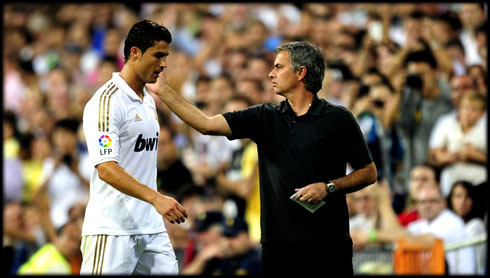 ﻿ Mourinho: "Cristiano Ronaldo is sad because the team lost"
12.12.2011» Mourinho: "Cristiano Ronaldo is sad because the team lost"
José Mourinho talked with the press to preview Real Madrid's match against Ponferradina, for the Copa del Rey, but he couldn't escape approaching a few topics regarding the "Clasico" and Cristiano Ronaldo performance. José Mourinho showed up in this Tuesday's press conference, to make a preview for the Copa del Rey fixture against Ponferradina. However, the journalists naturally insisted on asking the Portuguese coach about a few events that happened against Barcelona. 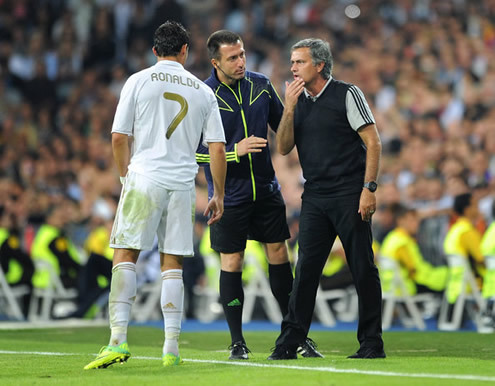 Mourinho affirmed that Cristiano Ronaldo won't be affected by the whistles he heard in the Santiago Bernabéu against Barcelona and that the only likely reason why he could be sad at this moment is because Real Madrid lost, rather than anything else that the press might speculate about. The Real Madrid coach entered the room alerting the journalists that he was there to talk about Ponferradina and not Barcelona, but his intents didn't last long. 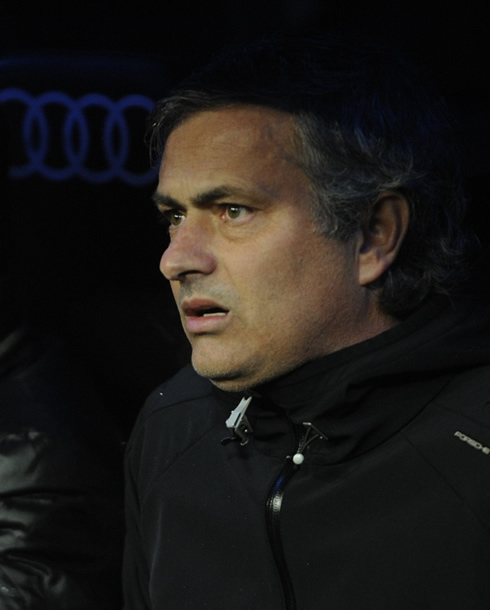 Mourinho: "I don't expect that the "Clasico" will affect our game this Tuesday. It's a total different match and we're also in a different competition. There's still no one with more points than Real Madrid in "La Liga" and in the Copa del Rey we're all at the same level. It's true that in the Spanish League Barcelona reached the exact same points that we have, but they still got one game more than us. It will be a natural thing that our rival's motivation in the Copa del Rey this Tuesday will be slightly higher than ours, but my job is to make sure that the players I select will be very professional, similarly to what we did last year against Murcia", stated José Mourinho when analyzing the match-up against Ponferradina. Last season, Real Madrid won the Copa del Rey with a Cristiano Ronaldo goal in the final against Barcelona, allowing the Merengues to lift a trophy that had been out of the club's reach since the 1992-1993 season. Mourinho confessed that it was one of the main objectives: "Last year we wanted to finally break the Copa del Rey recent bad tradition, by giving the club this important title. The season before that, Real Madrid lost 4-0 against Alcorcón, just as an example. We'll be prepared again this year, even though Xabi Alonso and Benzema will rest because they played the last two matches. We'll present a good team against Ponferradina and we'll attempt to decide this round stage right away", said the Portuguese coach, when promising a strong and competitive line-up against Ponferradina. 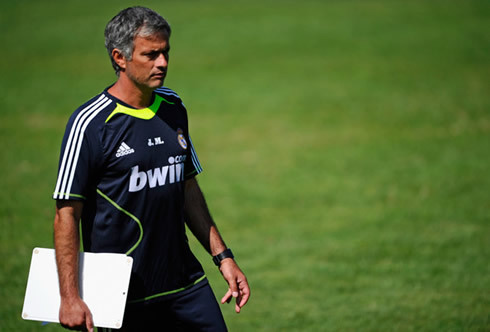 The "Clasico" shockwaves kept popping up and Mourinho assured that the team won't dive in any sort of depression, since there are no reasons for that to happen. 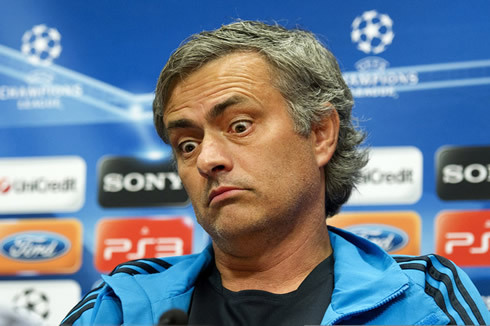 Mourinho: "If the World is about to end, then it's not our fault. We had already said that no matter what the result would be against Barça, we weren't going to lose our focus and emotional balance. However, it's true that winning makes you happy and losing makes you more sad. Nonetheless, I wouldn't exchange our current situation with any other club in Europe. We set the best record ever achieved in the UEFA Champions League group stage (6 games, 6 wins, 19 goals scored and 2 conceded). In the Spanish League, there's no other team with more points than us and we can either finish the year with the same points as Barcelona, or 1 or 3 points more", pointed out Mourinho when explaining the reasons why he believes Real Madrid keeps being in a privileged position in all major competitions. 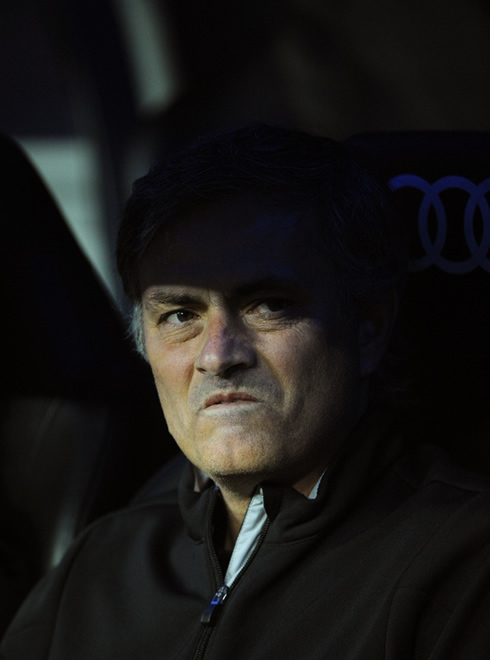 Mourinho also confessed he's very proud to have matched a club record that had been set by Miguel Muñoz. Mourinho: "My motivation couldn't be higher, by seeing my name being written in the same page as Don Miguel Muñoz, after matching his 15-game winning streak record, but also leading La Liga and setting a new record in the UEFA Champions League", said the "Special One", just before talking a bit about Real Madrid star, Cristiano Ronaldo and how he expects the Portuguese player to react to the boos and whistles that came from a few fans and supporters in the last "Clasico" against Barcelona. 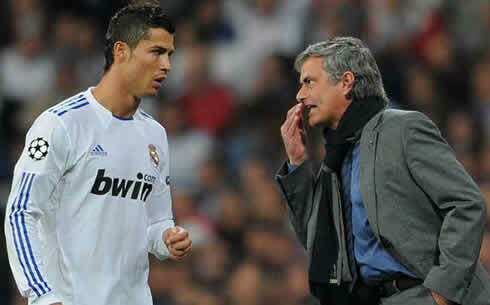 Mourinho: "If Cristiano Ronaldo is similar to me, he won't care about the whistles. He's affected and sad because the team lost a match, just like everyone else in the club is. It's perfectly normal that he is more sad today than he was 15 days ago, but there's no need to make a big drama out of this. Cristiano Ronaldo will travel to Ponferrada, because he has to help us winning a tough match", noted the Real Madrid coach when revealing the possibility of CR7 being in the line-up against Ponferradina. Real Madrid next game will be against Ponferradina, on the 13th of December, in a fixture for the Spanish Copa del Rey. After the harsh loss against Barcelona, Cristiano Ronaldo has been called up for this match and should participate in it. You can watch Juventus live stream, Ponferradina vs Real Madrid for the Copa del Rey this Tuesday, but also Barcelona vs Al Sadd on Thursday for the FIFA Club World Cup semi-finals, and QPR vs Manchester United on Sunday for the English Premier League. All these games will be available from our football live streams section. You may check how much time is left for the next Cristiano Ronaldo game, by looking at the countdown timer, located on the top right corner of all pages.